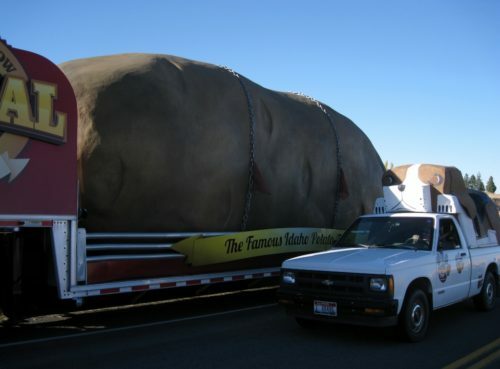 This week Roamer’s travels are close to home. 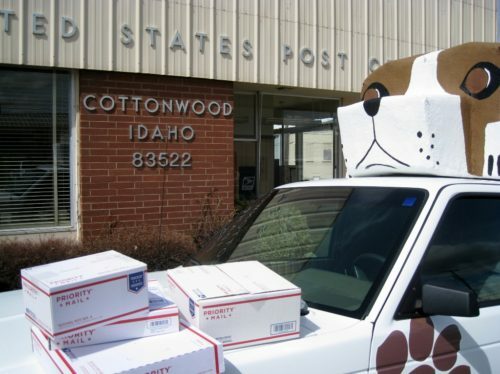 First he visits the Cottonwood Post Office to send off some wooden dogs to customers. 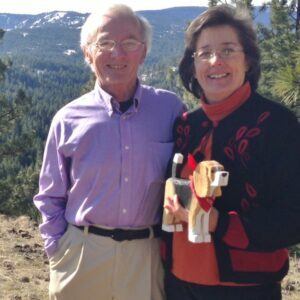 Dennis & Frances ship chainsaw carved dogs of many different breeds to folks who shop the Dog Bark Park chainsaw art gift shop to place an order for a dog carving or two. 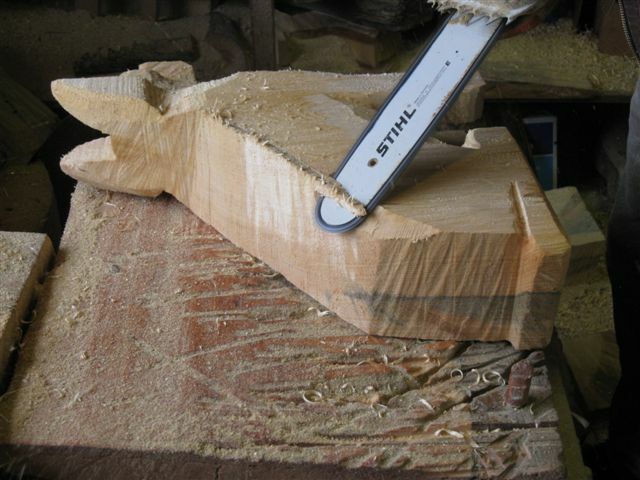 Delivery is usually in two weeks or less for the small-size carvings. With a population hovering around 1000 people, it’s not hard to find parking near any city businesses nor are checkout lines encountered. Roamer always gets waves from people, too & he likes that. 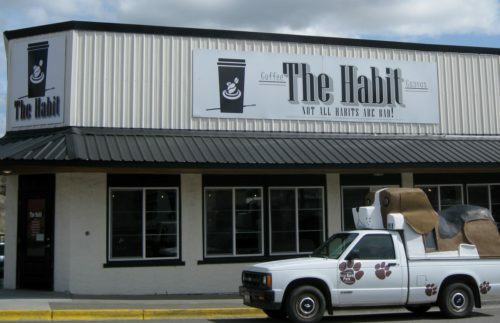 Next stop was for a beverage and snack from The Habit, Cottonwood’s newest coffee café. It’s located on Main Street one block from the post office and just under a mile walk from Dog Bark Park. 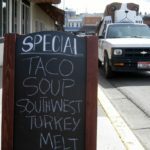 Soup, sandwich & coffee specials are offered daily. There are some signature coffees including one called The Big Dog! When customers mention they are Dog Bark Park guests a special treat or discount is also provided. 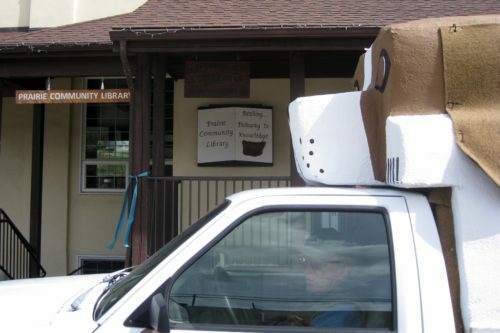 One block towards Dog Bark Park Roamer stops at City Hall which houses the city clerk’s office, the police department, the library and a community hall for events, classes and meetings. 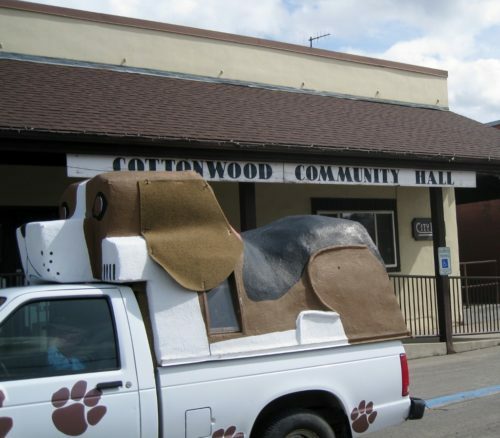 Cottonwood’s library, Prairie Community Library, operates in a bright newly remodeled space in the Community Hall. The library welcomes members and non-members to drop in to browse or use the computers. It’s a great place to hang out on a cold day or to cool off during the heat of a hot summer day. Open Tuesday and Thursdays and sponsors a summer reading program for children and other events. One browsing feature is a section devoted to books about Idaho and books by Idaho authors. 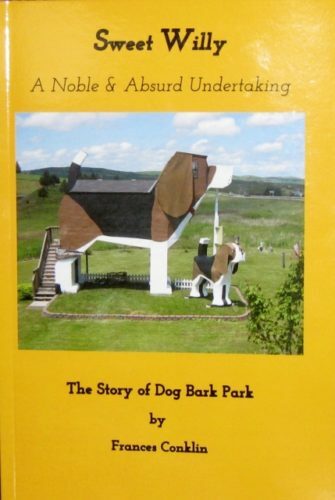 Roamer boasts the library has a copy of Sweet Willy: The Story of Dog Bark Park. 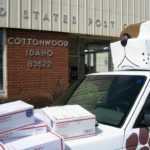 Meet Roamer, the travelling pup who will be bringing weekly stories of his travels in and around Cottonwood, Idaho. 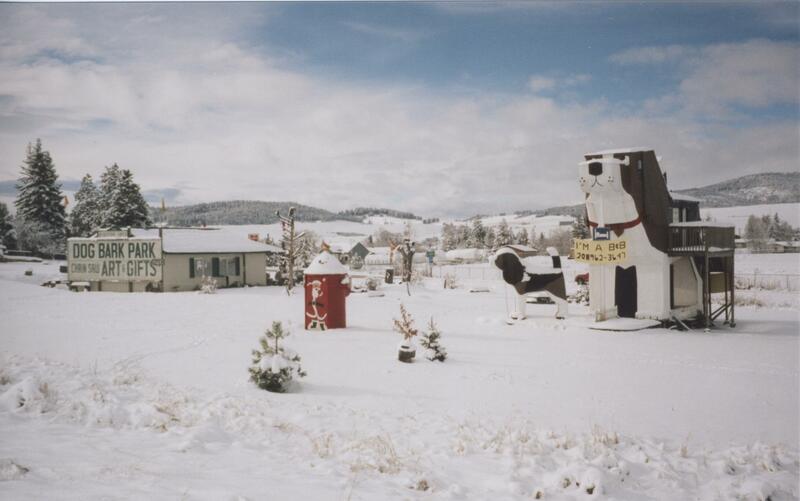 Each episode will feature scenery, activities and places in north central Idaho. This is the area from Riggins to Moscow, Idaho and from the Montana line to along the Clearwater River & up onto Camas Prairie at Cottonwood where Roamer lives at Dog Bark Park when he’s not travelling. Dennis, Frances & Sprocket will accompany Roamer on his adventures to discover both popular and little known places. 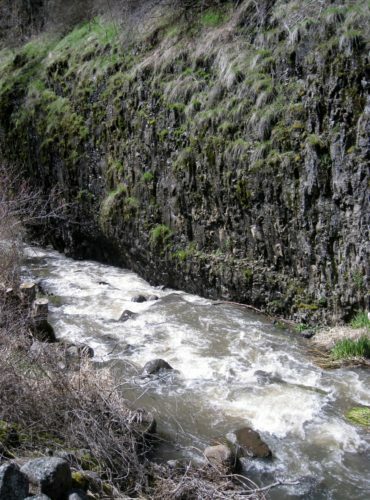 On a recent spring day we headed for Pine Bar Recreation Area on the Salmon River. 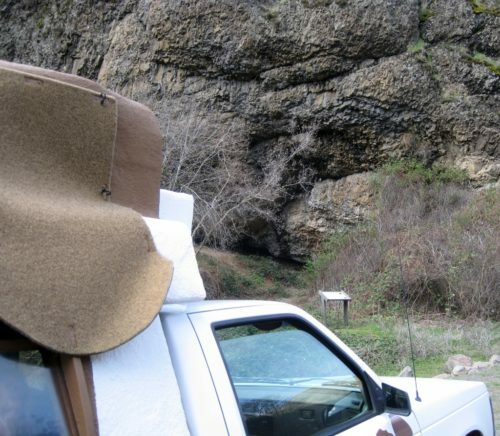 Pine Bar lies along the Lower Salmon River surrounded by semi-arid mountain peaks. It is a frequent put-in location for summer & fall floating the Lower Salmon via raft or power boat. Visitors can camp, fish, bird watch, swim or picnic here, too. But first, before reaching the river there were interesting stops along the way. Once leaving Hwy 95 three miles south of Cottonwood we turned onto Twin House/Graves Creek Road. After a few miles we leave the open prairie lands and begin descending into Graves Creek canyon along which flows little Graves Creek. The artifacts unearthed at the time of the archeological dig are stored at the University of Idaho in Moscow, Idaho 90 miles north of Cottonwood. 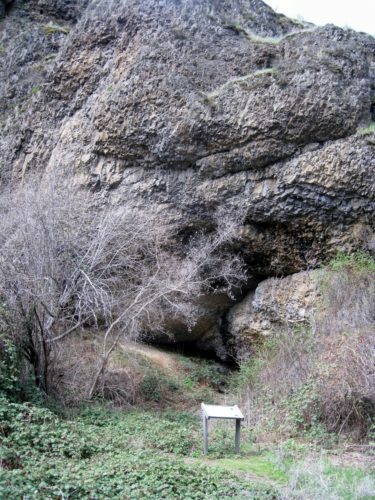 The dark area in the photo center is what is now only a shallow overhang of the rock after the alcove had been filled in to protect artifacts still present in the shelter. Episode 1 concludes with Roamer contemplating what life for a dog might have been like here 8,000 years ago. Certainly he would have had plenty of country in which to roam and most likely food enough to keep a pup happy. Need a new hobby? Try bird watching. We live in a great place for it! Have you ever considered bird watching as a hobby? It has much to offer. 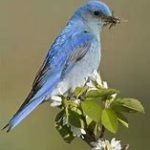 A recent article in the March issue of the The Ruralite magazine talked about the merits of Spring as a Prime Bird Watching Season. And here in the American West we have one of the best places in our country to view birds. 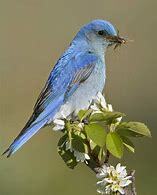 There are over 900 species of birds in North America. Over ¾ of them are found here in the West. 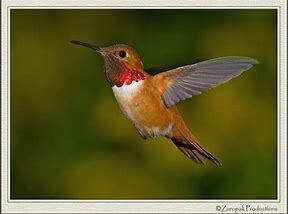 For instance, 15 of the 319 species of hummingbirds are found in the West. Some viewing areas near Cottonwood include: Tolo Lake , White Bird Battlefield, Pine Bar Recreation Area, & Fish Creek Nature Trails. Of course there are numerous bird species right at Dog Bark Park. Right now we are primarily seeing Robins, California Quail, Killdeer, Meadowlarks, Finches, Kestrels, & Doves. Bird watching is a great activity which requires very little in the way of equipment (binoculars, spotting scope will do). A good guide book helps in identification. Here are two suggestions: Birds of Idaho Field Guide and Idaho Birds: An Introduction to Familiar Species. Birds are everywhere. You don’t have to go far to enjoy this pastime. You can start right in your own backyard! If you develop a passion for this activity, then you can branch out to waterways, coastal areas, forests, fields, mountains and deserts. Happy Birding! And thank you to VisitWhitebird.com for some of this article’s content. 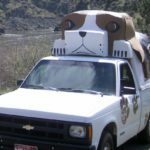 My beagle Darwin was no stranger to cross-country drives and adventures. we sat on the couch and I realized we’d never made it to the big beagle. the western part of the state. again, I booked a room in the huge hound for early September. honey-colored fields and looks out to the prairie. 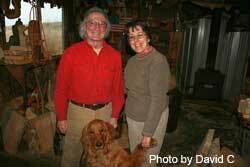 Artists Frances Conklin and Dennis Sullivan built the 30-foot beagle in 2003.
sold his canine carvings for 18 months. 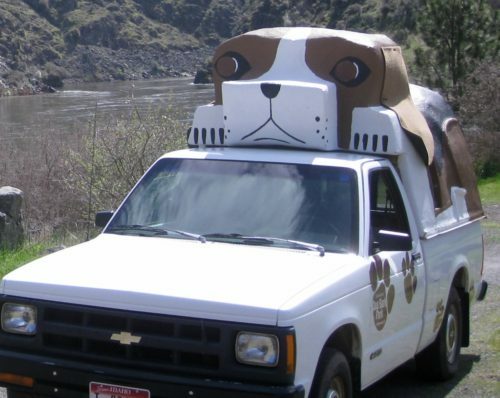 In the first 45 seconds, he sold 1,500 beagles. and buy the land on which their inn now sits. Hammy and me in the beagle. and a dry breeze entered. The smell of pine filled each breath. surprised he was a golden retriever, not a hound. “Why beagles?” I asked, after Frances gave us our room key. hair dryer, etc. — but we couldn’t forget for a moment that we were inside a dog. that opened up to the size of a card table. wooden canines decorated the headboard. wrapped in metal lath, a bendable mesh, over which stucco was applied. toaster oven, fire hydrant) while Hammy begged for tater tots. in the belly, talking about life and travel and love. 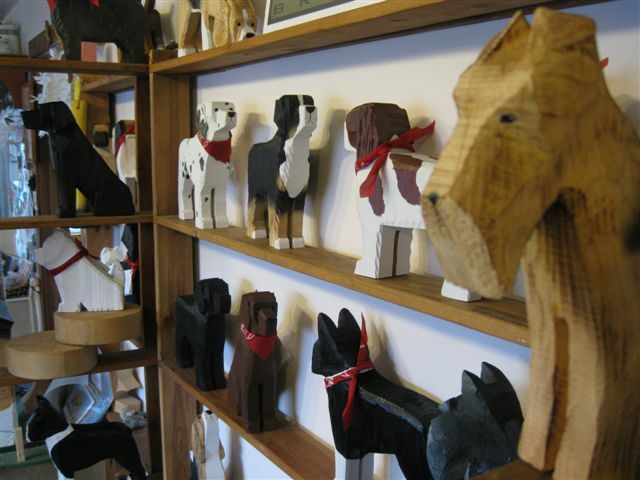 wooden dogs — and sawdust — covering every horizontal surface. she kneeled on the floor to help the girls with their puzzles. and “magic” repeatedly to describe their journey — and that of the Dog Bark Park. Heidi’s eye, we shared a knowing look. car, oblivious to the thoughts swirling through my head. Kaplan is a freelance writer in Washington. Her website is melaniedgkaplan.com.